The start of 2014 brought us to an incredibly devastating state of Tyson’s illness. By the grace of God, the healing hands of Dr. Shroff and Tyson’s own unbelievable strength, we avoided the ultimate tragedy. So, this year has been about recovering from a near-death state and maintaining a stable condition. The nice thing is, he always feels good when he’s in India. The trouble in the past has been when he comes home, he declines a bit as a result of numerous factors. Our first order of business was to determine what steps we needed to take or changes that needed to be made in order to avoid any decline in his health. First, he needs Physical Therapy as much as possible. This does not coincide with what our insurance deems necessary for his case; the most they’ll offer is 3 days/ week (criminal, no?). So, in the past, I’ve spent an inordinate amount of time fighting with our insurance to try to get more help for Tyson all the while, he’s weakening. In addition, we struggled quite a bit to even get him to these measly 3 appointments at Burke because of the weather and the increasing level of difficulty involved in transporting Tyson (which of course sent me down a dead-end road of pursuing a transport service that would, in theory, pick him up at home and drop him off). The other piece of the puzzle is that Tyson now requires assistance while I am at work. We lasted as long as we possibly could without any help, but with Tyson’s recent struggles, we realized this couldn’t be avoided any longer. So first, we set out to find a physical therapist who could come to the house for the sessions. I did a search online and found a company in Old Greenwich called Elite Health Services that looked pretty impressive. They worked with professional athletes and everything on their website seemed very thorough. I gave them a call on August 30th. I briefly explained our situation and the receptionist was able to connect me right away with the director of PT. His name is Mike and I got a great vibe from him straight away from our phone conversation; he seemed energetic and enthusiastic. As I began to tell our story, a part of me was admittedly nervous for what he might think. Sadly, Chronic Lyme disease within the medical community is often viewed as a mythical diagnosis and completely disregarded and on top of that, Tyson was receiving experimental stem cell therapy. I was afraid that Mike might take one look at Tyson and tell us he couldn’t help him. The other part of me didn’t care. I don’t care if people don’t believe or understand what Lyme disease can do. But the bottom line is: we need someone to help us. Mike came to the house to meet Tyson and myself that following Wednesday. We thoroughly delved into Tyson’s medical history and Mike didn’t flinch. We could tell he was as eager to get started as we were. Tyson and Mike discussed short term and long term goals and I couldn’t help but point out the photograph on our wall of Tyson dunking during a high school basketball game and said, “we want this. Can u get him here again?” We all laughed a bit 🙂 (I need to add a little levity when we’re discussing such a heavy subject). Our first session was September 5th (our 5 year anniversary 🙂 ). And not only is Mike incredibly energetic, he is also extremely knowledgable. He has some background in respiratory therapy which is rare for PT’s and lucky for us! Right away, he noticed that he could feel Tyson’s muscles contract when doing leg extensions with him and so forth. In the coming weeks, he began a regimen of leg and shoulder exercises as well as shoulder, neck and breathing/lung work. Tyson felt better almost immediately and after the first day, we knew that this was the missing piece of the puzzle. Through Mike, we were able to find this wonderful home health care company called Privatus that introduced us to Doug, Tyson’s aide. Doug is so great. He’s smart, patient, and truly cares about Tyson. It takes a LOT to get Tyson comfortable; he is literally trapped in his own body so when he wants his foot moved an eighth of an inch or his hips moved or his masked taken off and put back on 10 times in a row, it can be very frustrating for the caregiver. But like myself, Doug understands that regardless of how “annoying” it may be for us to try to meet Tyson’s demands/requests, it’s a million more times difficult for Tyson to be in the position he’s in. Doug does everything to make Tyson comfortable and that makes me happier beyond words. Quick interjection with this story of our doctor’s visit: We met with Dr. Katz, our neurologist, at the end of September. We hadn’t seen him in several months and he admitted he was nervous/anxious to see Tyson after hearing briefly about what happened this spring. As we entered his office, his face lit up! He was so happy with Tyson’s appearance, despite his voice being at a whisper. He said it seemed as though something had shifted; almost as though he had turned a corner and was making a trek towards recovery. Regarding the sparks of improvement Tyson experiences…he said “once you begin to see improvement, there is no limit to what can be accomplished”. Like I said before, if it were truly ALS, there would be no improvement. None. So while the improvements may seem minor, they’re in fact extremely significant. I brought with us a letter from Mike describing his progress and projection plan with Tyson; Dr. Katz was thoroughly impressed. Tyson and I felt good. We’ve actually never left a neurologist’s office with a smile. The therapy sessions continued Monday thru Friday for the next several weeks with Tyson experiencing little to no decline. I would definitely describe this trip home as “productive”. He returned to India just before Halloween for a 6 week stay. His time in India was also very productive. He received stem cell injections throughout the day and had several procedures over the course of the 6 weeks. We weren’t able to talk much largely due to the time difference ( 10 1/2 hrs) and because he spent a significant portion of his day in bed resting. We texted daily and I spoke with his mom often, which was really great. I know I’ve said this before, probably a million times, but it’s tough being away from him for so long. However, knowing he was with his mom and best friend and with our family at Nu-Tech, put me at ease. Tyson saw improvements in his core and neck muscles. What frustrated him greatly was that his breathing and swallowing had not improved during this trip as we had hoped. What I pointed out to him was that we had only begun to receive stem cell injections in his chest in the past year while the rest of his body has been receiving them since Day 1; they just need time to catch up. And the fact that we are seeing ANYTHING improve is reason to remain positive and hopeful. The day Tyson came home in December, it was easy to see how much he was struggling. This trip had been rough for him. The flight was delayed several hours which meant that from the time he left the hospital to the time he finally was seated on the plane was approximately 7-8 hours. The most he had been in his chair was only a couple hours on average and then he would need to rest his body and give his lungs a break by putting his bi-pap mask on. So, this extended period of time was completely overwhelming for his body. 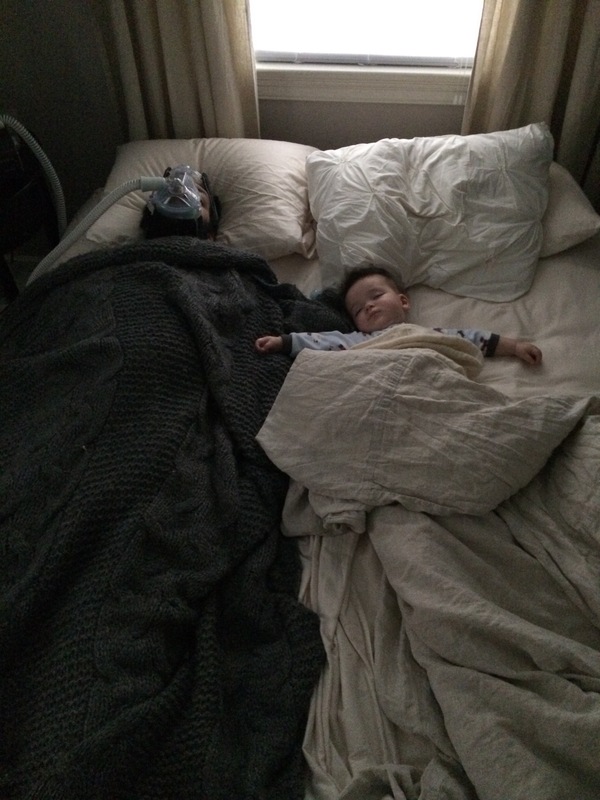 He was hooked up to the mask for the car ride from the airport to our house and almost immediately I put him to bed for more rest. I scheduled Mike to resume PT session on Monday which would give us the long weekend to recover. The first day, he did not get out of bed. I didn’t really think much of it considering how brutal his trip had been. Over the next few days, he stayed in bed. I was able to get him up and in his chair on Saturday and Sunday for 20 mins each day. He just couldn’t breathe without his mask and the swallowing was equally challenging for him. His saliva had become too much to swallow, and when this happens, he is forced to spit into a towel. I’m sorry for the details- I want you to know what he’s going through and it just is what it is right now and to be honest, I’ll probably never fully share all that we go through, for your sake. 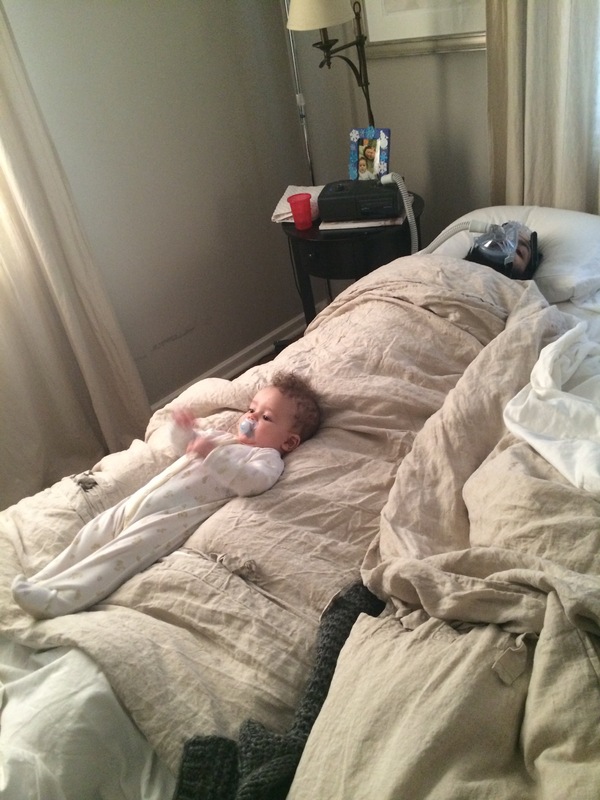 Anyway, by Monday, he still wasn’t able to leave bed, so Mike did PT while Tyson laid in bed. This is how the rest of that week went…and the following week. We all thought he would recover from his jet-lag after one week (I mean, let’s face it, a 15 hr flight home from India is difficult for anyone) but we were reminded once again that the reality is- it simply takes longer for him to recover than it does for you or me. After about 3 wks of doing PT in the bed, Mike contacted me for help with Tyson. He expressed his concern with him not getting out of bed and said that in order for Tyson to make any improvement, it was mandatory that he do his PT sessions on the physio table or at least from his wheelchair so that Mike could work with his hips and shoulders. I told him I was certain that Tyson was experiencing some fear and anxiety regarding the breathing and that I would be present at the next few sessions in order to help him get over the hump. And that’s precisely what happened next. At the first few sessions, Tyson even had me sit directly in front of him while he was on his side to help calm him, just to give you an idea of just how scary it is for him to struggle with his breathing. As usual, Tyson proved to be stronger than he gave himself credit for and is doing well with PT. With the help of our friends at Burke, we’ve found a speech therapist who focuses on “breath support” and will come here on Tuesday for a consult and hopefully begin working with Tyson as much as possible. She will help him learn to breath and swallow more effectively and also strengthen his lungs and mouth muscles (put those stem cells to work!). We look forward to meeting her! We begin and end each day by thinking of all of the wonderful things we are grateful for. We have so much. 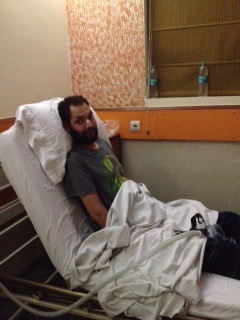 And so, I’ll wrap this up by thanking all of you for your endless support and prayers and positive vibes. Thank you for the dinners, the groceries, the company, the texts, the calls, the messages to make us smile, taking Cal for play dates, shoveling me out of the driveway, lending an ear or a shoulder, your patience and understanding and for the many donations to the TysonFowlerFund. You have no idea how this all lifts us up and keeps us moving. And finally, thank you to Mike and Doug and our doctors who stand with us in this fight. I have more I am working on and will update again as soon as things materialize.